Favorite Things: Stand Mixers. What color is yours? Home » Rose Water & Orange Blossoms Blog – Fresh and Classic Lebanese Recipes » Favorite Things » Favorite Things: Stand Mixers. What color is yours? As with anything, it’s the physical that is always the first sign of attraction. There must be some kind of color chart that indicates the meaning behind the color you choose for your stand mixer. Or maybe I should write that chart if none exists. 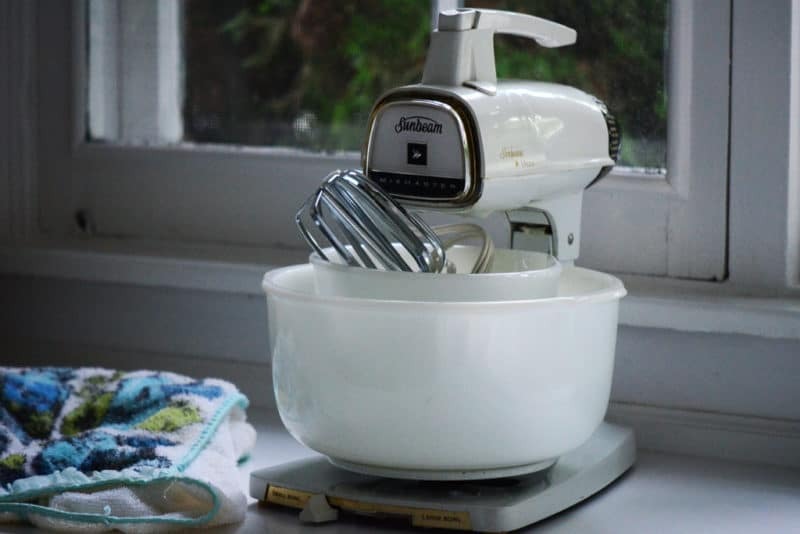 My mother’s original stand mixer is a white Sunbeam, purchased no doubt when colors for workhorses like a mixer were just a glimmer in a marketer’s eye. It is still here in Harbor Springs where, when my parents first bought the place, all older things came. The mixer is old-school, and it’s not used anymore, but we love it so much that we keep it not downstairs on the shelf, but smack in the lazy susan next to the sink. It was the best in its day, Mom says. Colors may not have been standard, but how about the dial on the back of the mixer that tells you which task each speed is meant for? Form meets function. 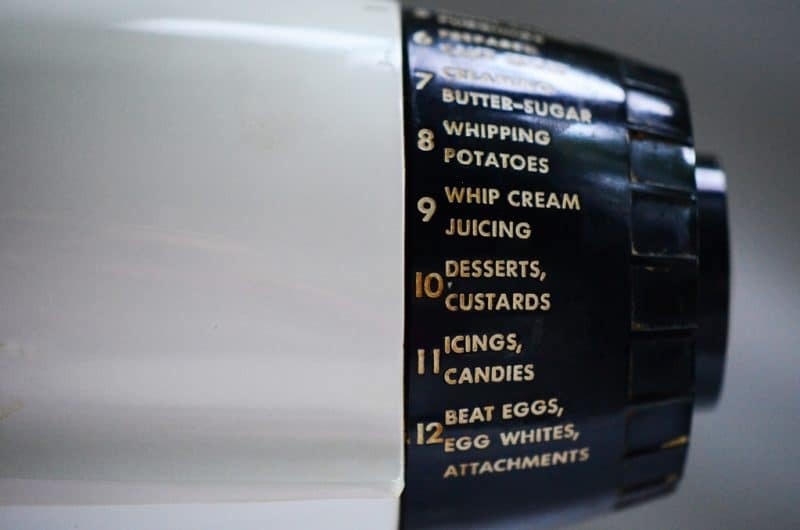 It’s not surprising that #10, Desserts, is rusted out for its use. When she upgraded to a new KitchenAid at her house on Wagon Wheel Lane, my mom chose the color of the moment, harvest gold. It strikes me that the rest of her kitchen may well have been designed around that mixer, and why not, the golden yellow with some tomato red thrown in for contrast here and there. She has never been one to shy away from color, or from a good re-do of a room. 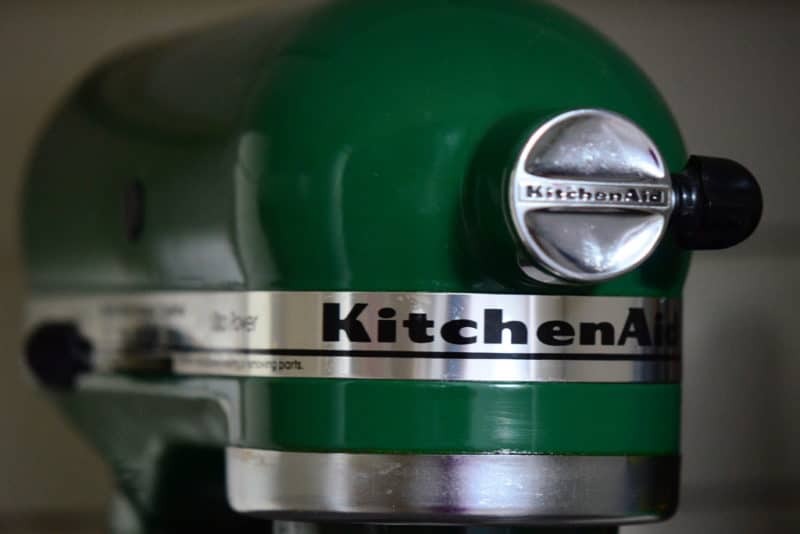 My first stand mixer was a bright green KitchenAid. I was so excited about it that I looked the other way when I saw that the lock knob was broken. You have to hold it in the locked position whenever you lift it up to be sure it isn’t going to gape open and fall and break your feet. I didn’t have the patience to exchange the mixer for another, so I kept her, lame as she was, and she has repaid me heartily by keeping up with me to this day. The shiny green sat like a bright lighthouse amid the old, blah renter’s kitchen in that apartment, calling me at all times to spruce things up with a cake. A new, high-powered, brushed stainless steel KitchenAid mixer with all of the bells and whistles landed on my doorstep almost the moment I was engaged, from Patti. When I later lamented to her that the mixer was not put to the uses for which it was intended, Patti comforted me that she gave me the mixer because it’s beautiful, because she wanted that strong hunk of a machine to be in my kitchen wherever that kitchen was, and that the mixer would be there waiting for me when I was ready to embrace it and bring it along with me when I discovered where I was headed. A line-up of KitchenAid mixers in every delicious color has been the window display over at Culter’s in Petoskey forever. I can’t help but stand in front of them whenever I’m there and imagine selecting the bubble gum pink one, or the candy apple red one, wondering what interesting thing that might mean about my personality and how the rest of the kitchen, the house, the life might unfold from there. You know we are making something special with our mixers this week, and it isn’t a cake (though that does sound good). It’s homemade ice cream that doesn’t require an ice cream maker, which is a good thing because I don’t have an ice cream maker. But it does require a mixer (you choose the color), of which I do have several, at the ready. 9 Responses to "Favorite Things: Stand Mixers. What color is yours?" Mine is grey. I’m thinking of adding orange flames like Alton Brown’s. I have it on good authority, it will work better and faster. Mine is white – and I love it. But I have white sheets and towels too. What does that say about me?????? Mine is white….took me a lot of years to buy one. My mom always used the hand held ones or a wooden spoon and a lot of elbow grease. It just seemed toooo easy. 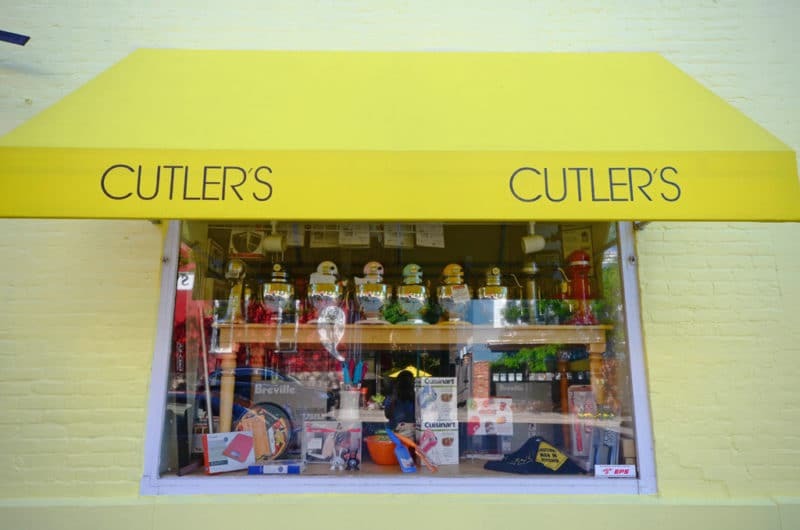 I love Cutler’s, right here in my back yard in Petoskey. Is there anything that store doesn’t carry? Can’t wait to see what that “something special” is your making. Mine is that funny yellow from the 60’s and that’s how long it’s been with me. I can’t imagine my life without it or my favorite accessory, the meat grinder. Love your blog. Thank to my sisters for telling be about it. Elaine, wonderful to see you here. Thank you for sharing and how amazing that those mixers never quit. I’m sure you’ve made many great dishes with your home ground meat…. Mine is navy blue. I just love to look at it, hee, hee.